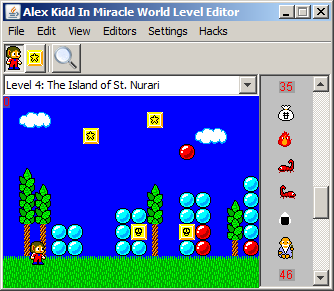 Welcome to the official home of KiddEd – An Alex Kidd in Miracle World Editor! 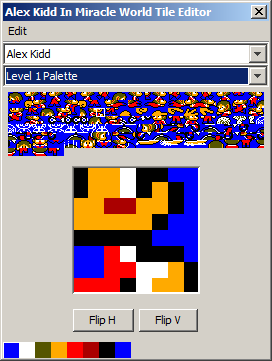 KiddEd is an Alex Kidd in Miracle World Editor. 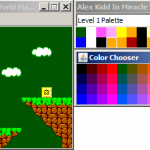 This free to use editor allows editing the game Alex Kidd In Miracle World for SEGA Master System. It will run on Windows, Linux, MacOS(X) and any other operating system supporting Java SE. All you need to run KiddEd is Java 1.6 or newer. No installation needed – just extract the files and run KiddEd.jar. 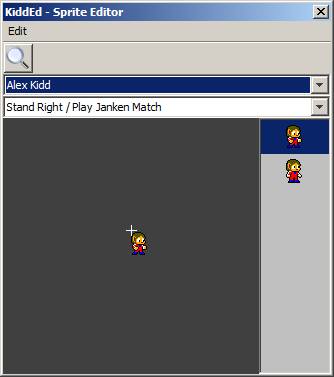 In order to edit Alex Kidd In Miracle World you will need a ROM of it. 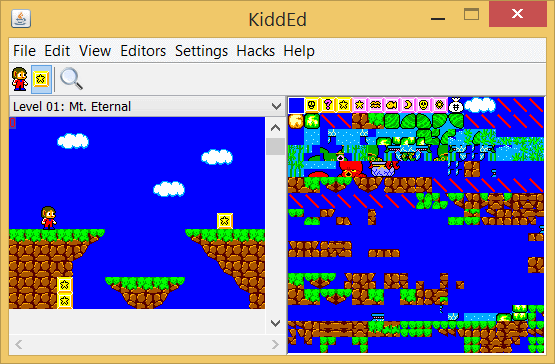 Until now KiddEd only supports version 1.1 of the game. 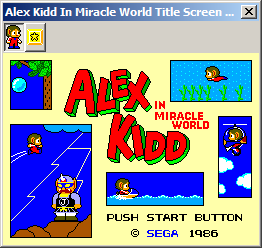 This version is also known as Alex Kidd In Miracle World [v1]. 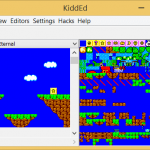 If you’re running Windows and don’t have Java installed and don’t want to install it you can download KiddEd (with Java for Windows). It contains the Java binaries necessary to run KiddEd. After the download has finished you need to extract all files to a directory of your choice (running KiddEd directly from the zip archive won’t work). After extracting all files you can start KiddEd by running KiddEd.bat. Windows might tell you that the file could harm you but you can convince yourself that it doesn’t cause any harm by opening the file with a text editor to see that it’s only contents are start java\bin\javaw.exe -jar KiddEd.jar %*. That means running KiddEd.bat tells Windows to start KiddEd.jar with Java. %* means that it should pass through all arguments passed to KiddEd.bat to KiddEd.jar. This allows you to drag&drop ROM files on KiddEd.bat to make it load the rom directly on startup. 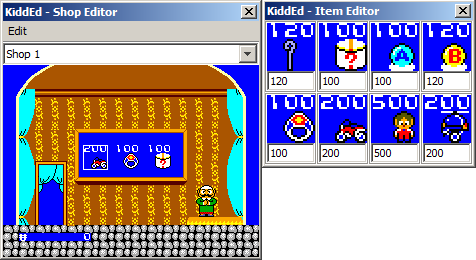 KiddEd allows editing many aspects of the game. The editing capabilities are split into several editors. For instructions on how to use these editors please read the ReadMe included in the download. 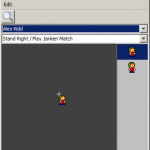 The Level Editor allows you to manipulate the layout and the entities of a level. 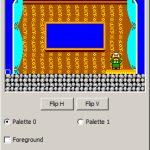 The Palette Editor allows you to manipulate the palettes used in the game. 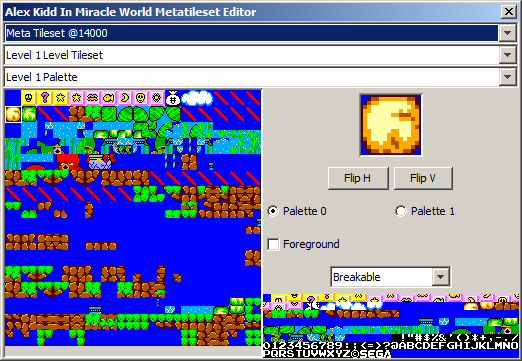 The Tile Editor allows editing all the tiles found in the game. 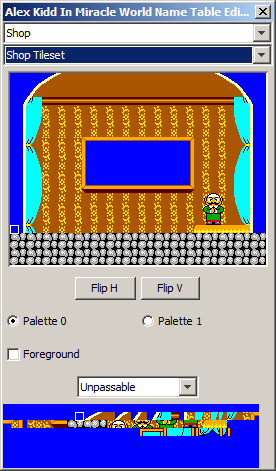 The Tileset Editor allows editing the tilesets for the levels. 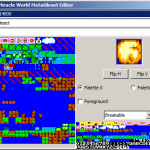 The Metatileset Editor allows editing the metatiles used to form the layout of a level. 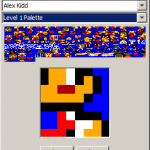 The Sprite Editor allows editing all sprites of the game. 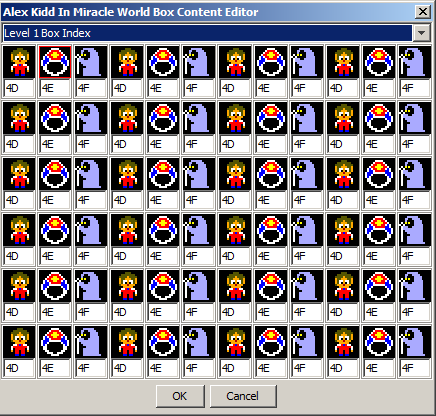 The Box Content Editor allows changing the contents of the boxes with a question mark on them. In Game Settings you can set initial game values like the amount of lives, the amount of money and the score to start with. There you can also set the level to start in. what music to play, what shop to use and what metatileset to use for the level layout. The Name Table Editor allows changing name tables (static images). 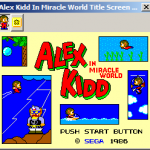 The Title Screen Editor allows changing the title screen. 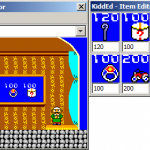 The Shop Editor allows changing the items being sold in the shops and provides an Item Editor to change the price of each item. 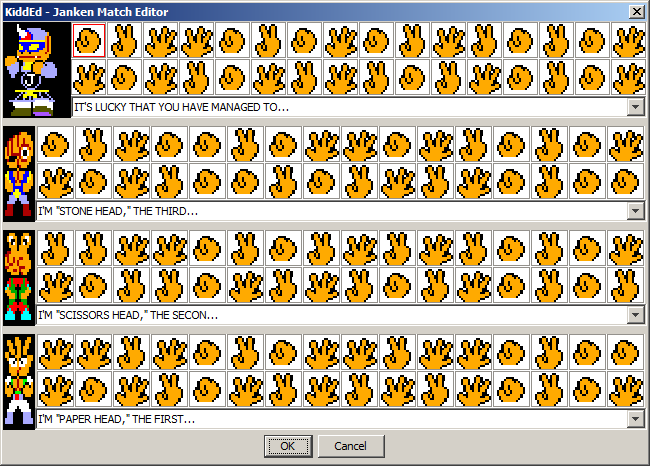 The Janken Match Editor allows changing the decisions made by Janken and his henchmen and their greeting messages. 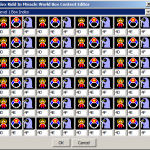 The Riddle Editor allows changing the sequence of symbols to trigger in order to spawn the crown in the last level of the game. 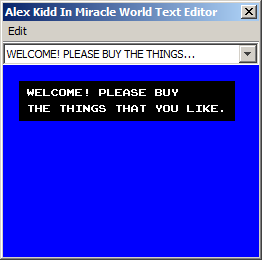 The Text Editor allows changing all of the text in the game. 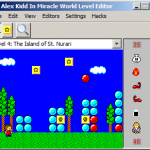 The Physics Editor allows changing the physics of Alex Kidd. The Sound Editor allows playing and changing all sounds of the game.